The painting “Three Women” belongs to the African period of Pablo Picasso. At that time, some primitivism of African art combined with a huge magical component served as inspiration for Picasso. African artists did not try to convey authenticity or beauty. It was important for them to speak the natural forces opposing humanity throughout its history. In the picture you can see an unusual combination of African motifs and the latest ideas of Cubism. 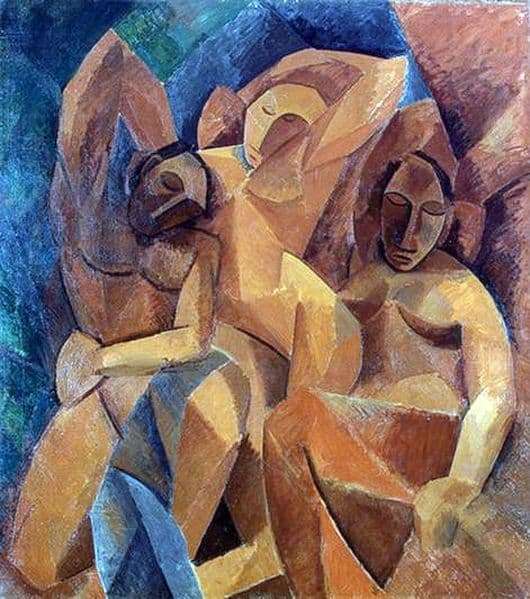 The three women in the Picasso painting look more like rocks – the same angularity, sharp features, even in color they are indistinguishable from the rock close by. Picasso destroys the usual forms of objects. Objects and people in the picture are static, frozen in certain poses. Their figures consist of many planes, curved and concave. The picture appeared at a time when the very term “cubism” did not exist, it appeared after a few months, not without the influence of the artist himself. Picasso is both a conservative (African story) and an innovator. This is one of the first cubic stylizations where Picasso works not with non-living objects, but with people. He still uses spheres, cones, cylinders and other geometric forms in his still lifes of that time. In contrast to the paintings that appeared after a few years, in “Three Women” there is still no complete rejection of form, one can distinguish bodies, faces, poses. The figures seem to be created by a rough sculptor or a carpenter who knocked them out with the help of a primitive ax. The “sections” of the sculpture were painted in various shades of red. Despite the fact that not everyone appreciated the new trend in painting, for Picasso, the picture became a turning point. The artist began to be respected by numerous collectors (in particular, the Three Women were acquired by his wife Stein) and finally stopped experiencing any material difficulties.